The yields on energy master limited partnerships (MLPs) are very tempting. If you’re not sure what these are, energy MLPs are companies that own the pipelines that transport oil and natural gas around the US. And they often pay huge dividend yields. A look at the top five oil MLPs shows they have an average dividend yield of 5.3%. That’s more than twice the S&P 500 dividend yield of 1.9%. I even found one oil MLP that is paying a crazy 18.4% dividend. But while the yields are generous, many of them are very unsafe. And that could spell disaster if you hold them in your portfolio. I’m always on the lookout for safe income opportunities. Here’s why oil MLPs are not one of them. Of those top five oil MLPs I mentioned, the average payout ratio is 104%. So if a company has earnings per share of $4 and pays $2 in dividends, it has a payout ratio of 50%. The lower the payout ratio, the more sustainable the dividend payment. When the payout ratio is over 100%, the company is actually dipping into its cash reserves to fund the dividend. Or worse, they’re using debt to finance the dividend. A company can’t borrow to pay its dividend for very long. That’s even more true when oil prices are tanking. There are two reasons for the decline. The first is rising global supply. Saudi Arabia, Russia, and other producers have been wary of production cuts. 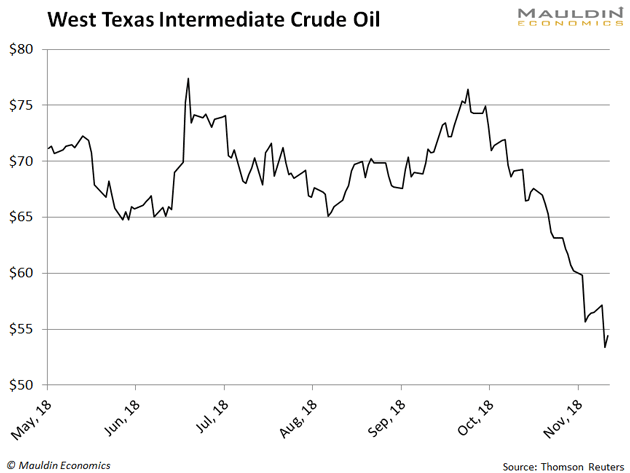 This has left markets awash in oil. When supply is rising and demand stays constant, prices are bound to fall. The second reason is fear of a global economic slowdown. Weak European economic data and a struggling US stock market have roiled the energy markets. Oil pipeline MLPs are often directly linked to the price of oil. When prices fall, MLPs make less money. That leaves less money for investing in the business and—you guessed it—paying dividends. And when a company cuts its dividend, it’s bad news for the share price. In December 2015, Kinder Morgan (KMI) was the largest oil pipeline operator in North America. The company had raised its hefty dividend for five straight years. In fact, the dividend was raised 30% each year during this period. But oil prices were doing the opposite, falling from $105 per barrel in July 2014 to $43 in December 2015. 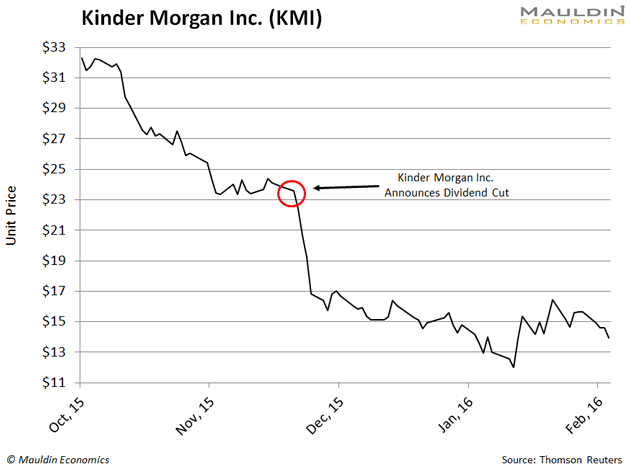 Then the unthinkable happened: Kinder Morgan cut its dividend. It wasn’t a token reduction, either. Kinder Morgan slashed its dividend by 75%. The news shocked investors. Many had piled into the nation’s largest pipeline operator because they thought the 8% dividend yield was safe. And when you catch the market off guard, you get punished. In the days following the announcement, shares got chopped 28.6%. To this day, shares of Kinder Morgan have not recovered. But they weren’t the only company to meet this fate. Major pipeline operators such as Plains All American Pipeline LP (PAA), NGL Energy Partners (NGL), and Enbridge Energy Partners LP (EEP) would cut their dividends in the months that followed. This tanked the entire MLP sector. The Alerian MLP ETF (AMLP) crashed 47% between June 2015 and February 2016. The writing was on the wall for many of these companies. Low oil prices reduced the value of the commodity they were transporting. This lowered the company’s earnings and made their dividends less safe. Today, I see a similar pattern with three other companies. When looking for unstable dividends, I always look at the payout ratio. A high payout ratio and falling or stagnating earnings is a death sentence for any company. If the company is also burning through cash and has a weak balance sheet, a dividend cut will soon follow. As we saw with Kinder Morgan, that’s bad news for shareholders. The first is Sunoco LP (SUN). Investors are probably being lured by the company’s hefty 11.8% dividend. But don’t take the bait. The company has a 670% payout ratio. That’s just insane. It means the company is paying out nearly seven times its annual earnings in dividends. To add insult to injury, the company has drained its cash from $86 million to $15 million over the last year. Next on the list is Martin Midstream Partners LP (MMLP). To the untrained eye, the company’s 18.4% payout looks enticing. But it’s anything but safe. The company has a 540% payout ratio. For every dollar the company earns, it pays out over five times that amount in dividends. And with a mere $3 million in cash on its balance sheet, the company is standing on its last leg. Lastly, we have Andeavor Logistics LP (ANDX). This $9-billion company pays an eye-popping 11.4% dividend. But it’s a trap. The company has a payout ratio of 204%. That means it pays out twice its annual earnings in dividends. Its cash position has sunk from $75 million to $30 million in under a year, so the company has little left in the tank. I understand the temptation to buy into these companies. But don’t be fooled. These are not safe dividends. With oil prices falling, these dividends are not safe. So whatever you do, steer clear of these ticking time bombs. Would you recommend shorting these stocks?